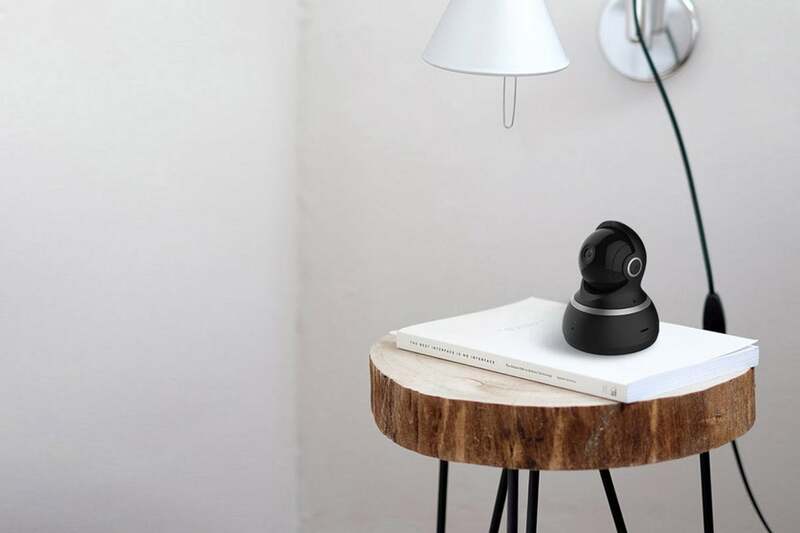 This pan-and-tilt home security camera provides near 360-degree views, motion tracking, and even cruise control. The ability to remotely pan-and-tilt your security camera isn’t essential, but it’s certainly nice to have. The feature is handy for surveilling larger rooms as well as tracking moving objects, whether it’s a wandering pet or a bona fide intruder. Unfortunately, too many executions are marred by laggy or imprecise movement. That makes the YI 1080p Dome a welcome addition to the home security scene. It’s panoramic monitoring capabilities are some of the best we’ve seen, and at just $60 it’s a steal. There’s nothing radical about the Dome’s form, which it replicates an earlier 720p version of the same camera. Its ball-style webcam design was looking dated a year or so ago, and it practically screams “surveillance!” no matter where you try to conceal it. Don’t be surprised if family and friends get a little creeped out when they see it. The spherical “head” houses a 1080p camera with a 112-degree field of view and eight infrared light beads for night vision. It has a motorized pan-and-tilt capability that you control from the YI Home companion app, and it rotates on its base 115 degrees vertically and 345 degrees horizontally. 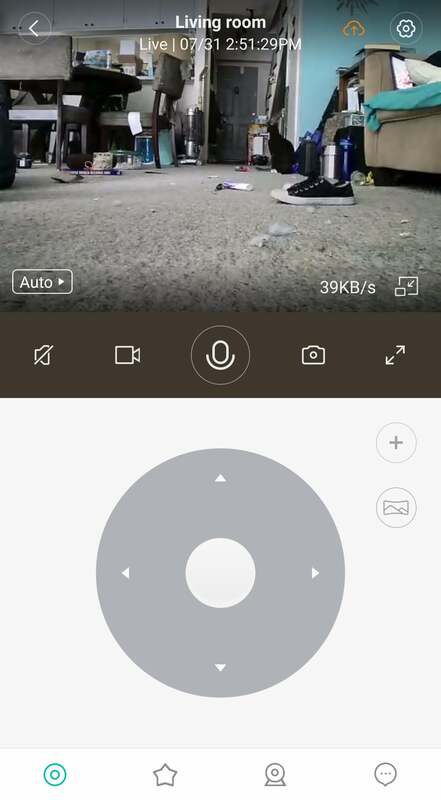 The camera module is set within a kind of hood that, when you tilt the camera all the way up, functions as a privacy shield by covering the lens. The Dome can rotate 345 degrees horizontally and 115 vertically. On the rear of the base are a microUSB power port—there is no battery-power option—and a microSD card slot where you can store up to 32GB of video locally. This last provides a nice backup to YI’s flexible cloud storage subscription options: a 7-day plan costs $6.66 a month or $66 a year, a 15-day plan costs $10 a month or $99 a year, and a 30-day plan costs $15 a month or $149 a year. 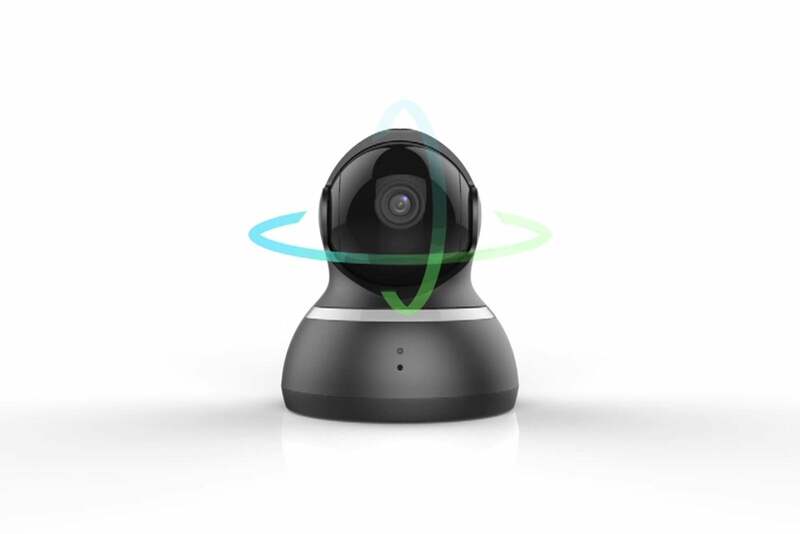 For all three plans you can choose to upload only motion-detected videos for up to five cameras, or 24/7 around-the-clock upload for a single device. Each plan also comes with a one-month free trial. Security camera setups rarely go as smoothly as their “quickstart” guides promise, but the Dome is an exception. The YI Home app immediately found my Wi-Fi network, and with the help of some voice prompts, I had the camera connected and running within a couple of minutes. It's worth noting, however, that the YI 1080p Dome Camera can only connect to a 2.4GHz network. If that frequency band is heavily congested in your home, you'll be better served by a model that gives you the option of connecting to a dual-band router's 5GHz network. Controlling the Dome with YI Home app is a delight as well. Upon opening it, you’re taken to a devices screen where all your connected cameras are displayed. From here you can share a camera with family members, see all activity alerts associated with it, and access that camera’s settings. You can direct the Dome's pan-and-tilt manually or through automated methods. Tapping the camera image opens the Dome’s live stream. A toolbar below the feed pane displays the usual camera controls, including a push-to-talk button, and ones for recording video, taking a screenshot, and turning audio on and off. You can also change the camera’s resolution from right in the video stream. The bottom half of the screen is occupied by the Dome’s pan-and tilt controls. The default control is a classic-iPod-style directional pad, with which you can manually direct the camera, along with a button for setting waypoints, which the app calls “bookmarks.” Alternately, you can capture panoramic scenes at the push of a button—the camera will make a full horizontal sweep taking incremental shots and save the finished panorama to your cloud account. A navigation bar across the bottom of the screen provides access to other pan-and-tilt controls, including all your bookmarks; motion tracking, which enables the camera to follow a moving object as it records; and an Auto-Cruise feature that continuously sweeps the room either 'round-the-clock or on a schedule you set. The Dome’s video was tack sharp with vibrant colors. The camera uses a proprietary distortion correction technology to straighten the fisheye edges that normally occur with wide-angle lenses. The result is the details at the boundaries of the image remain crystal clear. The only real blight is that the picture tends to wash out in bright sun and strong lamplight. 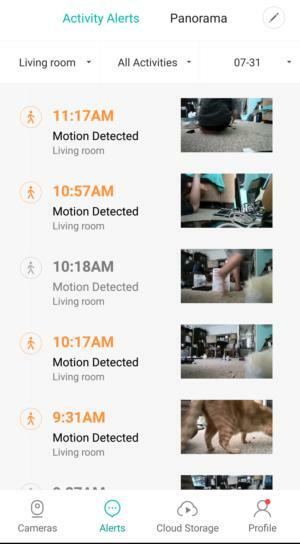 Motion detection was responsive and accurate during my usage. You can adjust the sensitivity on a sliding scale of low, medium, or high; I found the middle to provide just the right amount of vigilance. To keep your phone from blowing up with alerts, the app also includes an alert frequency slider, which you can drag to increase or decrease the “cooling off’ period between notifications. You can also schedule alert-free time slots. The Dome detects motion and can track an object as it moves through the room. The Dome also includes a “baby detection” setting. Although I didn’t have an infant with which to test it, YI says it recognizes your baby’s cries, which will trigger the camera to record a six-second video clip and push you a “baby cry” alert. Curiously, there’s no standard audio detection. All cloud-uploaded video clips are logged in a scrolling timeline, but getting to it could be easier. As it is, access to My YI Cloud is buried in the camera settings menu, and your videos are a good four taps removed from the device screen every activity alert opens to. That may not seem like many, but in a real-life scenario it’s a nerve-wracking amount of time between getting a heads up that someone may be in your home and actually being able to see who it is. And it’s possible the person could move on by the time you’ve had chance to review the footage. Hopefully, this will be improved in future updates. This last complaint aside, the YI 1080p Dome is an excellent camera. A great pan-and-tilt model is a rare find, let alone one as flexible and inexpensive as this. Whether you’re shopping for your first home security camera or your fifth, it's worthy of consideration. The YI 1080p Dome is an excellent pan-and-tilt camera with a couple of minor shortcomings that's available at a very affordable price.